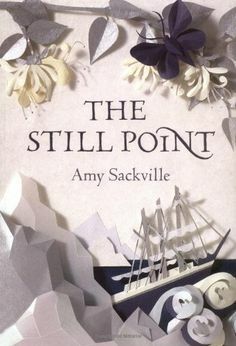 I ordered a copy of Amy Sackville’s The Still Point from the library after reading Kirsty’s review on her blog, The Literary Sisters. She talked about how Sackville’s prose reminded her of Virginia Woolf, which certainly piqued my interest, while the plot sounded intriguing too. Taking place over the course of one day, The Still Point follows Julia as she continues with her task of organising the artefacts preserved in her family’s house belonging to Edward Mackley, a man who explored the Arctic and never returned home. Julia is intrigued by Edward’s story, especially that of his wife Emily who was left waiting for him to return. Alongside this, Julia is desperately trying to ignore the cracks which are beginning to appear in her marriage. Yet as the day continues, Julia makes a discovery which causes her to question what she has always believed about Edward and Emily, and subsequently, her own marriage. The narrator of The Still Point has a ghost-like presence, being observing and all-knowing which means that the reader is too. We, along with the narrator, watch the action from the outside, almost like an extra character in the novel. The narrator may show us around the house while Julia is napping in the afternoon sun, for example, before bringing us back to her before she wakes. I don’t think I’ve read a book before where this technique has been used and it’s extremely effective in creating a full picture of these characters and their lives. It also allows Sackville to show us parallels between Julia’s day and her husband Simon’s, or between Julia and Edward. Some of these parallels did seem a little contrived at times but, on the whole, this worked well. It is Sackville’s writing which I loved most about The Still Point. The prose is poetic, and certainly has similarities with Woolf – the parentheses, the attention to detail, the slipping between perspectives. Sackville’s descriptions fully and beautifully evoke the opposing settings in the book – the warm, musty corners of the old house, stuffed with objects from the Arctic, the warm summer’s day and the cooling evening. Likewise, she evokes the brilliant white of the snow, the hunger, the solitude, and the despair of being stuck in the Arctic. The story of Edward and Emily is enchanting and, as well as Sackville’s writing, kept me turning the pages. While Julia and Simon’s story takes place during the course of one day, memories are recalled and Edward and Emily’s stories weaved through the book, meaning that The Still Point isn’t simply about a missing Arctic explorer and a family member sorting through the artefacts, but is a rich tale that has been beautifully told. Have you read The Still Point? What did you think? I haven’t read or (or heard about it til now) but it sounds wonderful. Will be putting that on my wish list! Haha! Yes, the cover is beautiful! I can see why this book piqued your interest. The way the narration is done sounds interesting alone! Also, I enjoy books that span a short period of time, the progression is what I like – I’m sure it is done well here what with interception of memories etc. Thank you for bringing this book to my attention. Great review! Thanks, Jade 🙂 I enjoy books which are set over the course of a short period of time too – it can keep the story tight and focussed which can work well. I’m always interested in any book that takes an unusual approach to the narrative voice, so I shall add this to my tbr list. I should warn you that adding it to the list and getting round to reading it are two entirely different things, but at least it won’t slip off my radar altogether. Glad you’ve added it to your list! I’d love to know what you think of the book if you do get around to reading it. I haven’t heard of this author, but seriously want to read this book! 🙂 It sounds wonderful. Thanks for posting about it. Great review. I haven’t read this one, but I recently bought her other novel, Orkney, as it sounded intriguing (and I’d also heard her prose described as poetic). I’m not sure when I’ll get to it, but I’m looking forward to trying her! Thank you for reminding me of this book. I have a copy somewhere and I liked Amy Sackvilles’s second novel very much – some plot weaknesses, but the writing was gorgeous. Beautiful review, Gemma! I love your comment about the ‘ghost-like narrator’. I remember Susan Sellers’ ‘Vanessa and Virginia’ being similar in that technique if you’re looking for something else to read! Thank you 🙂 Oh, I’ll have to take a look at that book, thanks for the recommendation! You’re very welcome; I hope you enjoy it!